Charming sunny single bedroom with attached bathroom, storage space, small desk area and direct attached roof terrace. Located 50 meters away from Durbar Square. Independent double bedroom with attached bathroom and full access to the beautiful Yatachhen’s kitchen, living room and roof terrace. Beautiful roof top loft with twin beds, stone bathroom and equipped kitchen. Attached sunny roof terrace with dining space. Charming and comfortable renovated apartment in an old Newari House. Double bed + single bed , spacious bathroom, fully equipped kitchen, working space… Located 50 meters away from Durbar Square. Single bedroom with bathroom and access to the shared kitchen. A good value for money and the chance of living in Prakash and Pramila’s Home in the old Patan. Two rooms with a shared bathroom. Ideal for a family or a group of friends that want to share the same space by still having their own privacy. Small balcony attached. A vast L-shaped loft with a bed corner, living room/kitchenette and bathroom. Little balcony and access to a spacious roof terrace. A very cute little duplex with an amazing view over Dhumbahal Buddhist Stupa. Four balconies, a comfortable bedroom with queen bed and AC, a modern bathroom and a very stylish kitchen/living room. Located on a quiet and authentic square 200 meters away from Durbar Square. Beautiful 1 bedroom studio apartment in Kwalkhu Chowk - All amenities and comfort, wooden balcony with view over Uma Maneshwar temple. Located 50 meters away from Patan Durbar Square and the Golden Temple. Independent garden house situated in heart of the historical city of Patan, right in the middle of all the beautiful heritage sites (Swotha Square). Enjoy the luxury of a green garden and all comfort like at home. Beautiful little independent cottage (room + living room), nested in a courtyard just a few meters away from the Golden Temple and Durbar Square. 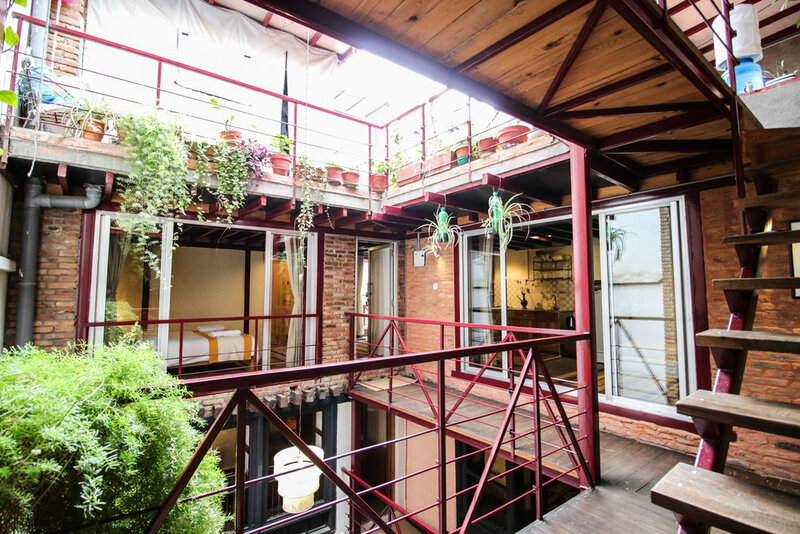 Top floor duplex with private roof terrace, located two minutes away from Patan Durbar Square. The unit is composed of a living room/kitchen, a spacious bedroom/study space, two bathrooms, two balconies overlooking Kulimha Square and a terrace overlooking Newa chhen Garden.